Happy Needle and Thread Thursday (finally)! Technology is a beautiful thing...when it works; and when the internet is completely down, it's funny how nowadays we feel lost. I am just old enough to remember a life without being connected all the time. Then later, the magic of dialing up to connect to the internet in college. It's amazing how so many crafts and industries have changed in such a relatively short amount of time, and my dependency on the internet is in sharp focus when it's gone. So, thanks for being patient with me. I'm glad to be back up and running! 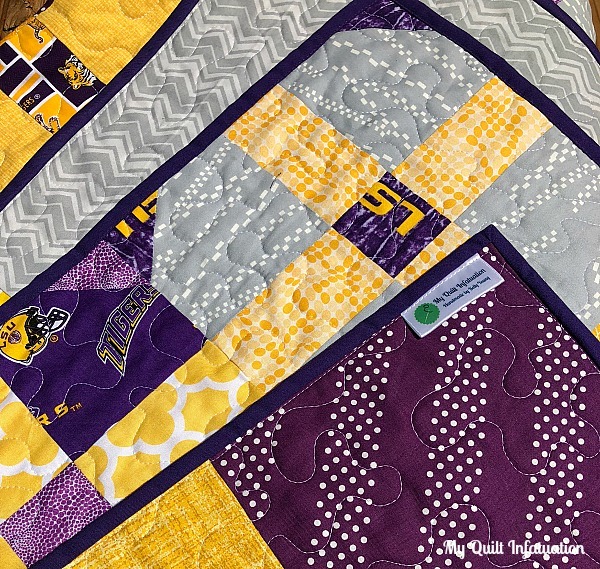 My most recent finish is this fun LSU quilt, made for a family member. 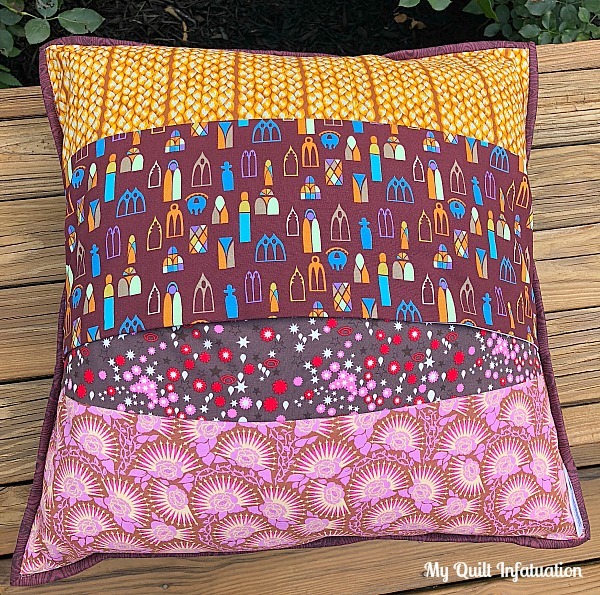 This pattern goes together so quickly, which is just what I have needed lately with the busy start to the school year. I opted for wide stripes on the backing, utilizing a little more of the licensed prints, and pulled a Kona Purple binding from my stash to finish it off. Before we get to the party, check out some of the highlights from last week. 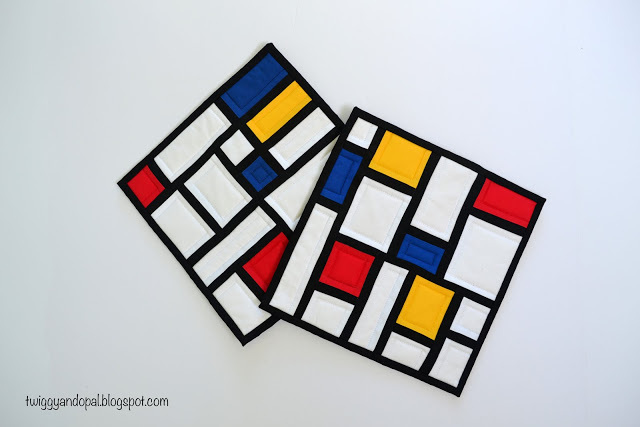 Something Rosemade shared this simple, yet fun quilt. Okay y'all! It's (finally) time to party! Well friends, I am sad to report that I am completely without internet and have been all day long. I am actually making this very short post from my phone. If it gets fixed by this evening or sometime tomorrow, I will post NTT, so be on the lookout. I even have a finish to share! Right now though, I am completely without internet, TV, and even my home phone. Boo. *Edited 8/30- hooray!! My internet has been restored, and NTT is happening right HERE! Thanks so much for your patience, friends! Happy NTT, friends. Do you realize that college football season is less than two weeks away? I've been so busy that it has sneaked up on me this year. 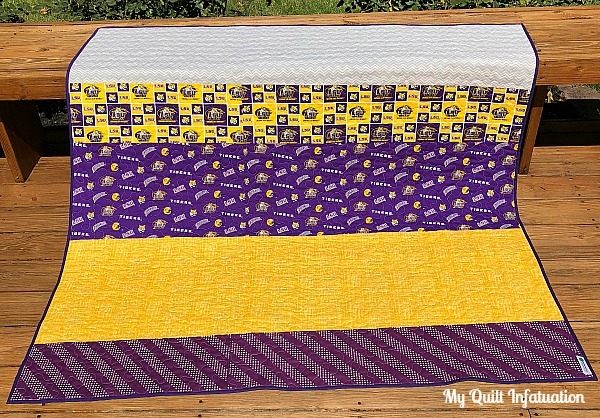 I figured now was the perfect time to whip up this LSU quilt for a family member that is getting married soon. Yes, that's how I roll. After all, color preferences can change over time, but sports fandom is eternal, and both the bride and groom love LSU. 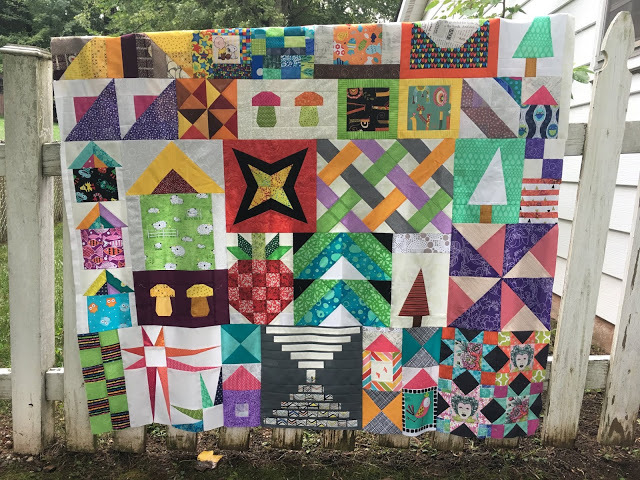 I got all of the blocks finished and pressed today, and I had just enough time before this post to get most of them up on the design wall to show some progress. These blocks are so quick, and I love the rounded look. I'm planning on a fast finish for this one. The top will be put together tomorrow, and it will hopefully be all done by the weekend. Just one more thing before we party. 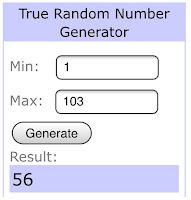 I owe you a giveaway winner from my August sponsor post! 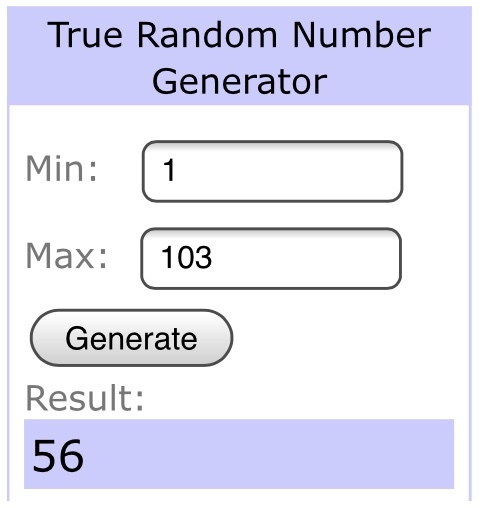 Comment number 56, Charlotte Nash, is the lucky recipient of the bundle from Fort Worth Fabric Studio. Congrats, Charlotte! I'll be contacting you very soon so you can get your prize! There were so many great projects linked up at last week's party. 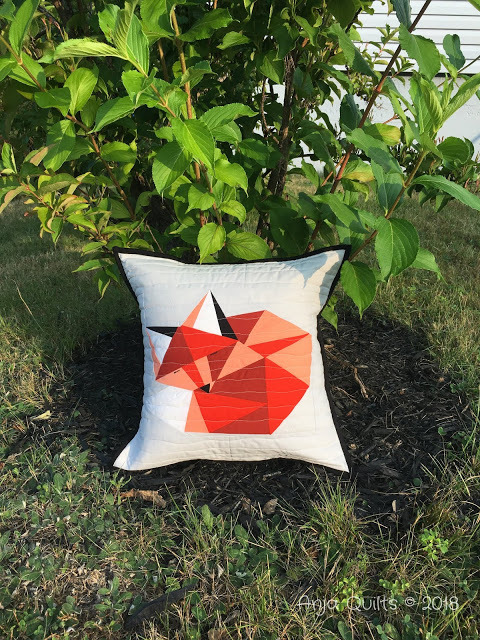 This fox pillow by Anja Quilts is just precious! 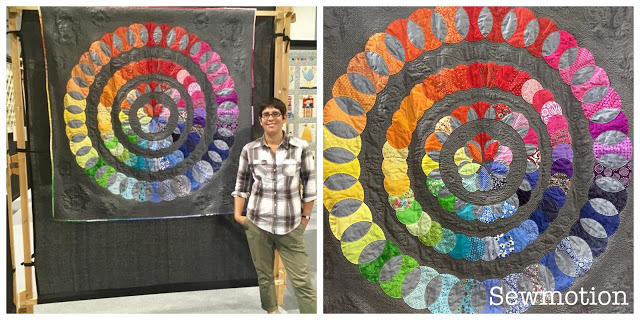 Louisa at Sewmotion shared her Rainbow Rings quilt hanging in a quilt show! Stunning! Okie dokie, friends! It's time to share your projects. Let's party! Happy NTT, friends! It has been a whirlwind week around here. On Monday, I presented a trunk show to a local guild, and I'm leaving on Friday to travel to another guild. I still have some availability in 2019, and I would love to visit YOU. My calendar is filling up though, so contact me soon for more details. 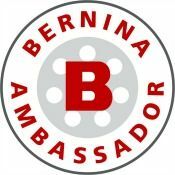 Let's get something booked for your group! 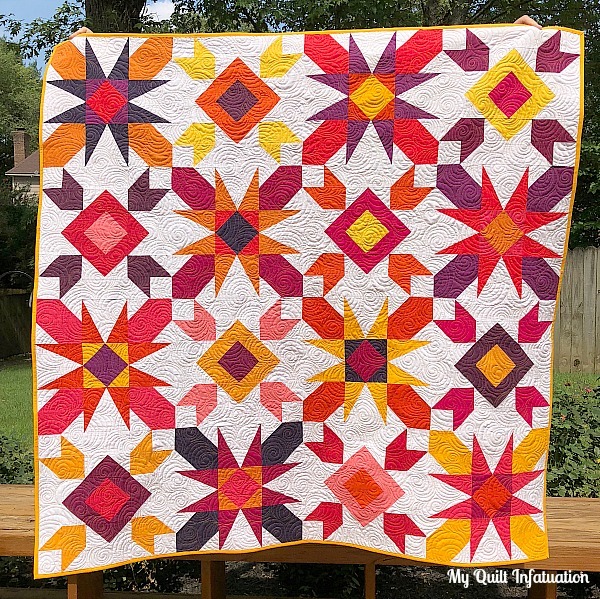 Since it also happens to be the middle of the month, between my two teaching engagements this week I've also shared my August Classic Meets Modern blocks as well as my monthly sales roundup (with an awesome giveaway that you can enter HERE). Even with all of that, I found time to finish my latest quilt. 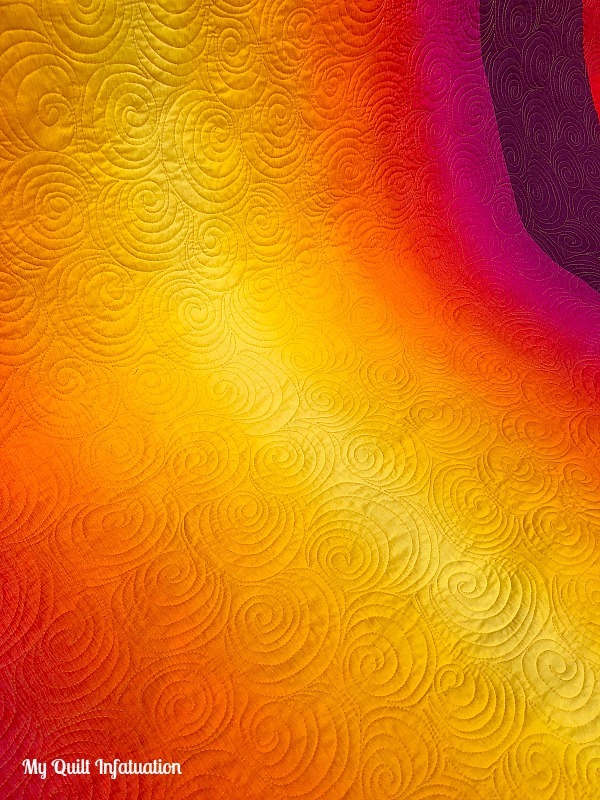 I'm calling it Aloha Sunrise, and I'm thrilled with the way it turned out. 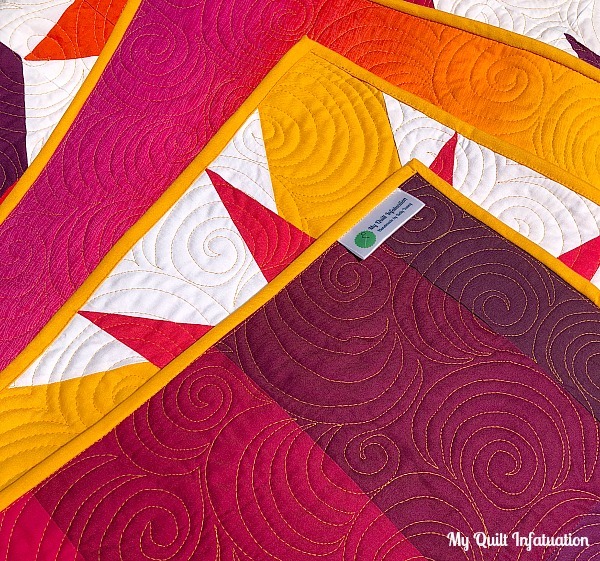 In case you missed last week's NTT, this quilt was created with the Kona Birds of Paradise bundle. 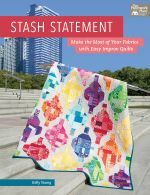 I picked it up at Quilt Market in May, and it will be available in shops very soon. PS- this is not a sponsored post, I just love the colors in this bundle so much, so I figured I'd give you the info. I added four additional solids from my stash, and all sixteen colors are listed for you in last week's post HERE. 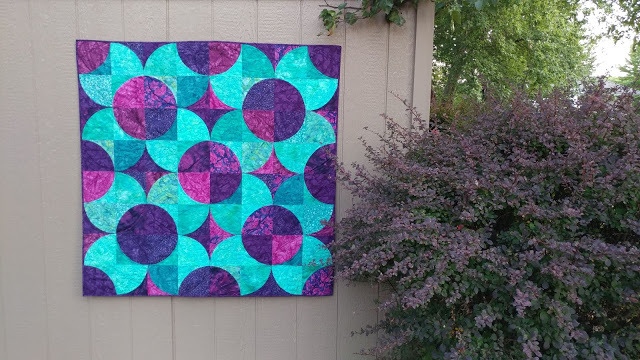 I quilted this one with a dense, allover swirl design. 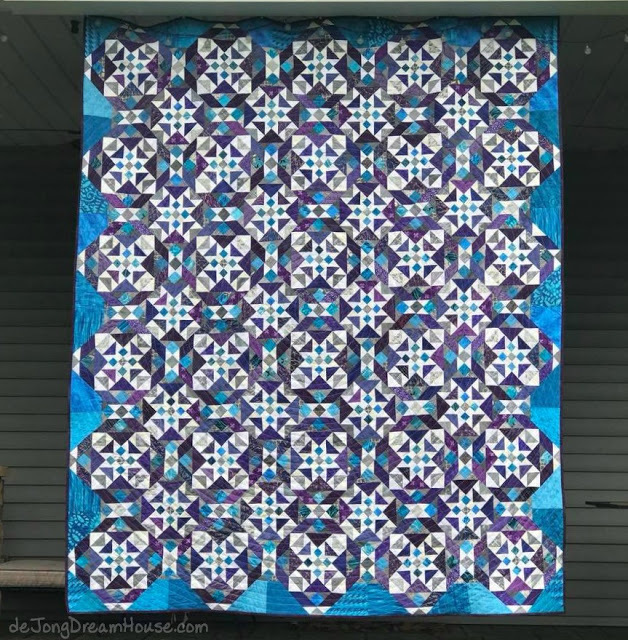 There were so many gorgeous thread colors that would have looked great on this quilt, but I ultimately chose Aurifil 50 wt. #2140, Orange Mustard. 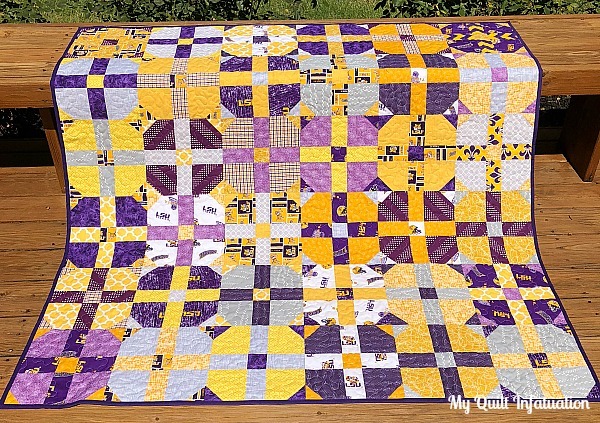 The darker, orangey-yellow added a little extra dimension to the quilt without standing out against the white too much. I almost quilted each part of the quilt with a different matching thread color, but did I mention that I've been busy lately? Ain't nobody got time for that, ha! Y'all, I might be as excited about the back as I am about the front of this quilt. 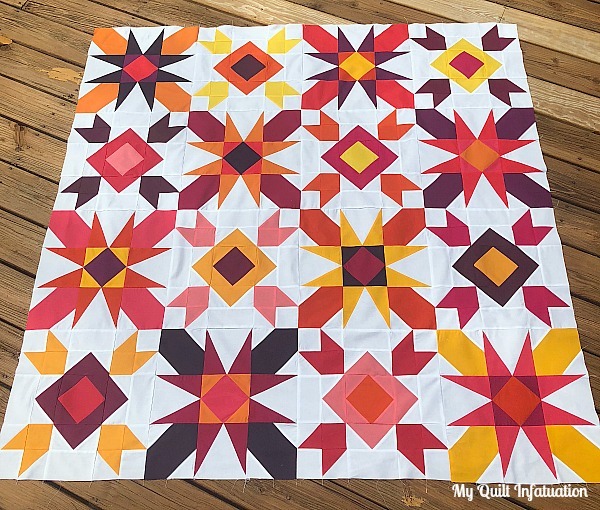 I had this Maywood Studio Gelato Sunrise fabric in mind for the backing, and was lucky enough that one of my local quilt shops had it in stock. Winning! I widened it out with some leftover solids and a solid Kona Berry strip right from my stash. 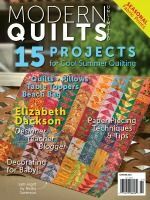 I love how the ombre glows, and the quilting texture shows up so beautifully against it. My swirls on this quilt make me so happy. 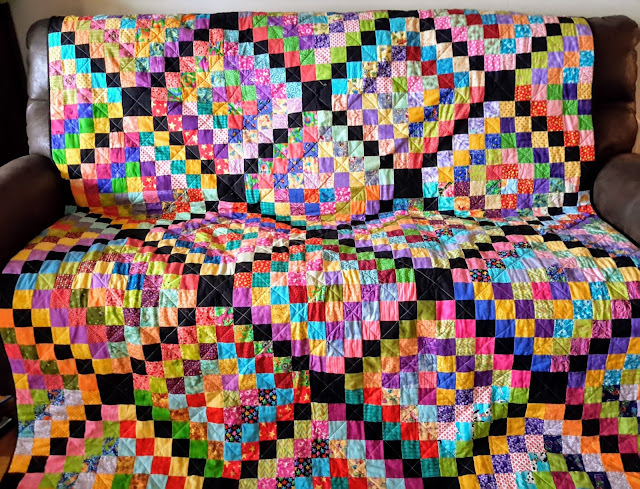 The last time I quilted swirls, they were much bigger, which made it more difficult to nest them together and keep them looking smooth. I decided to size them down this time around, and it made all the difference in the world. 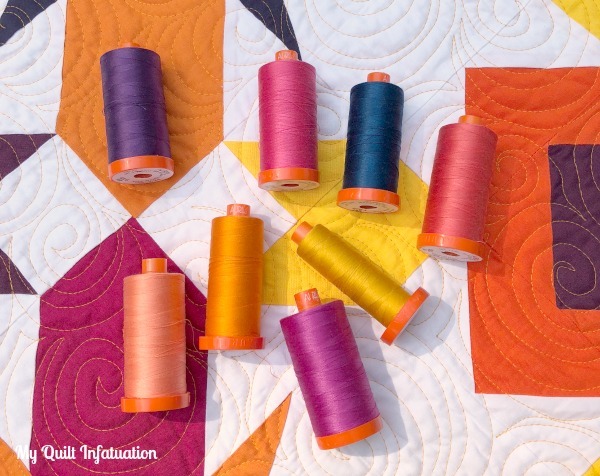 I had plenty of Kona Papaya in my stash for the binding, and though I didn't really choose the thread and binding colors together specifically, the fact that they are the same work so well on the quilt. Aloha Sunrise measures 60" square, and I am currently finishing up the pattern for it. It will be ready very soon, and will be written in three sizes. 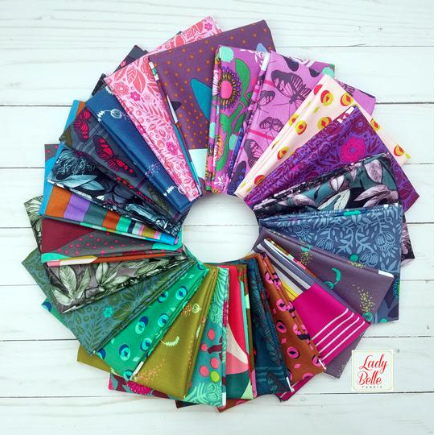 If you want to make one with exactly these fabrics, the pattern will be available just in time for the release of the Birds of Paradise bundle! Before we link up, take a look at some of the eye-candy from last week! 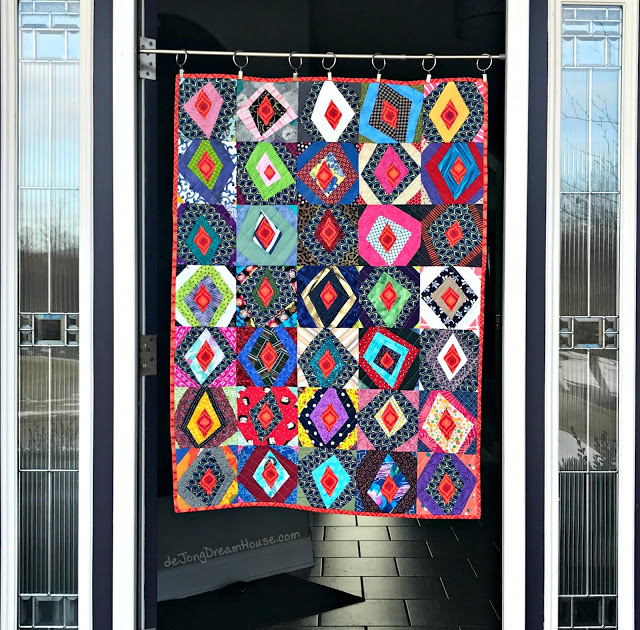 This lovely, classic HST quilt is by Michelle at From Bolt to Beauty (and don't miss the fun story of the origin of the fabric!). This round robin quilt, called The Wall, is by Kris at Sew Sunshine. Isn't it fantastic? 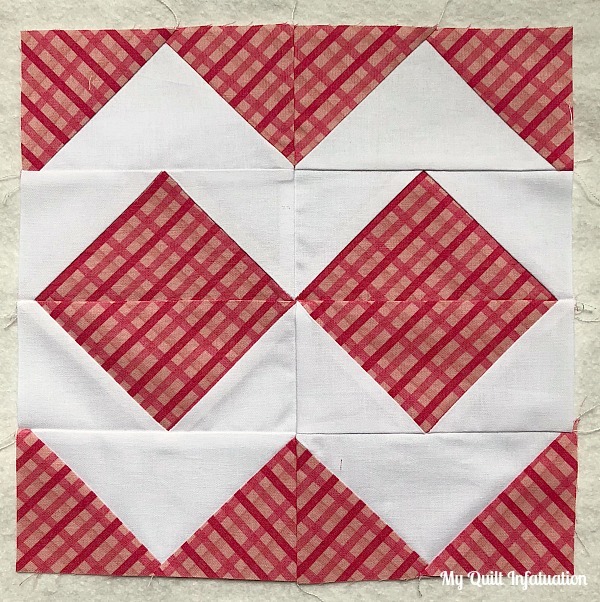 I love this value quilt by Cynthia at Quilting is More Fun Than Housework. 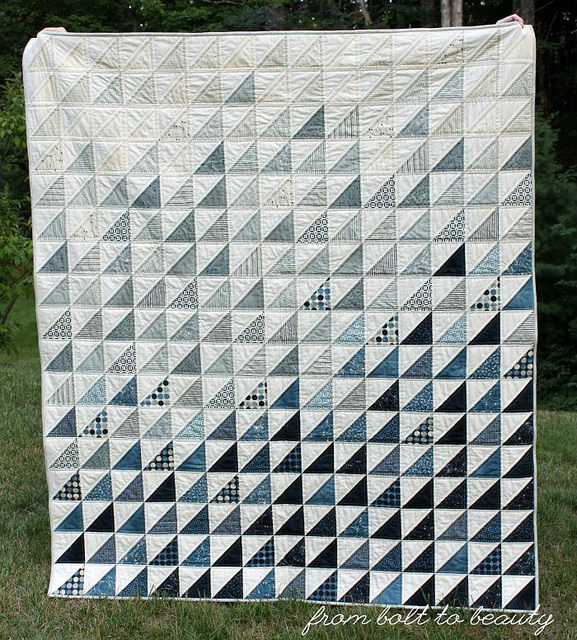 This improv diamond quilt is by Jen at de Jong Dream House. So scrappy and fun! I can't wait to see what you're working on this week. Let's party! 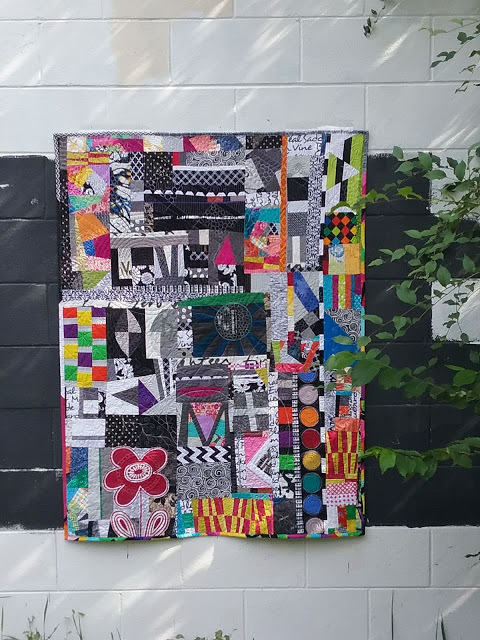 It is the 15th of the month, which means that it's time to share August's blocks for the Classic Meets Modern BOM Quilt Along! Each of this month's blocks finish at ten inches, and are pretty quick to put together. 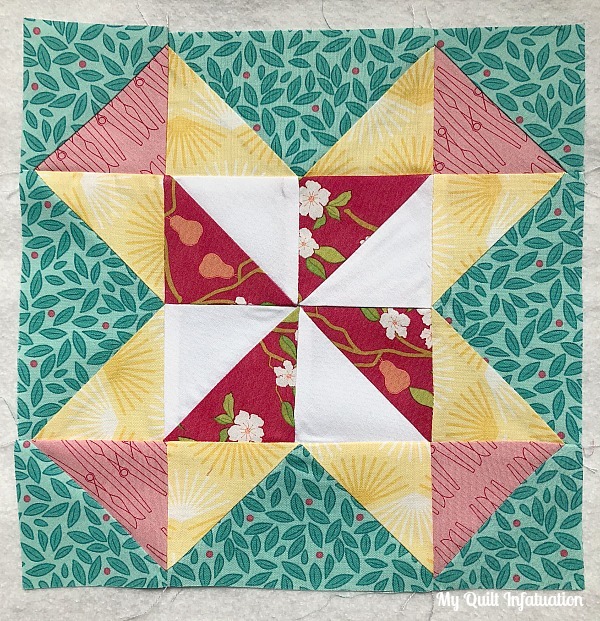 First up is the Dutch Pinwheel block. 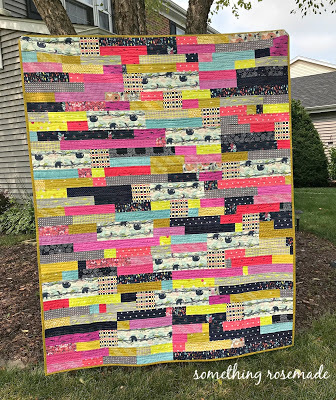 I love blocks that have a scrappy look, so a block with five different fabrics (including the white) was really fun for me. The Chevron Diamond block is the second block for August, and it is lighting fast if you chain piece those squares on the flying geese. 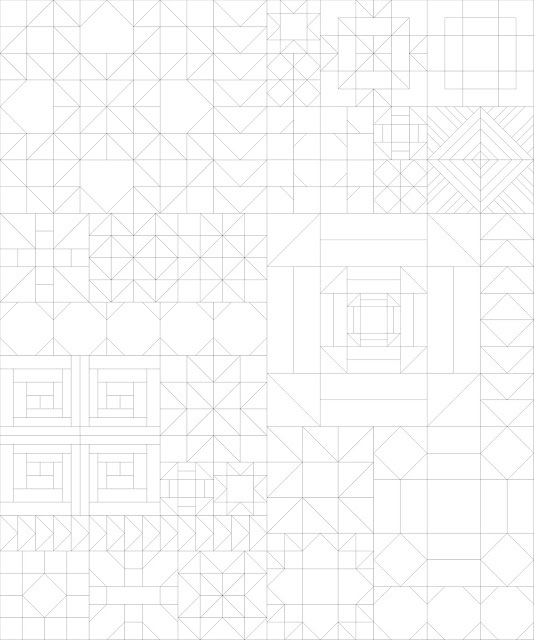 Instead of a white background, I chose to make my chevrons white. Even though there is exactly the same amount of pink and white in this block, the white chevrons just pop right out and really draw the eye. When I was determining my color layout, I also thought that this area of the quilt needed a little more solid white. 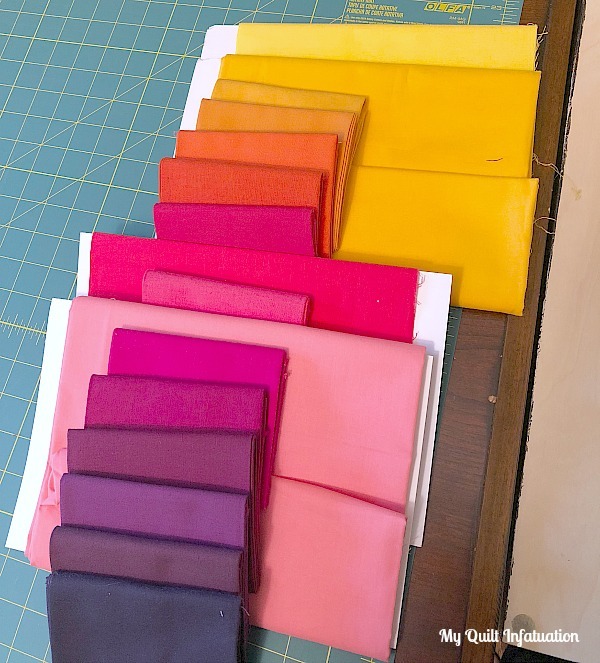 How are you deciding on your fabric placement? Are you using your blank coloring/planning sheet? Something Rosemade has a fantastic method for making sure she has an even distribution of colors. 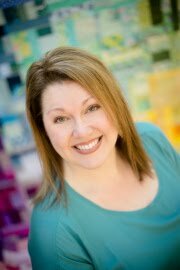 Check out her post HERE to see how she is cropping her block photos and laying the blocks out digitally. It really is awesome, and I think I'm going to have to take a little time to do that with my own blocks soon. 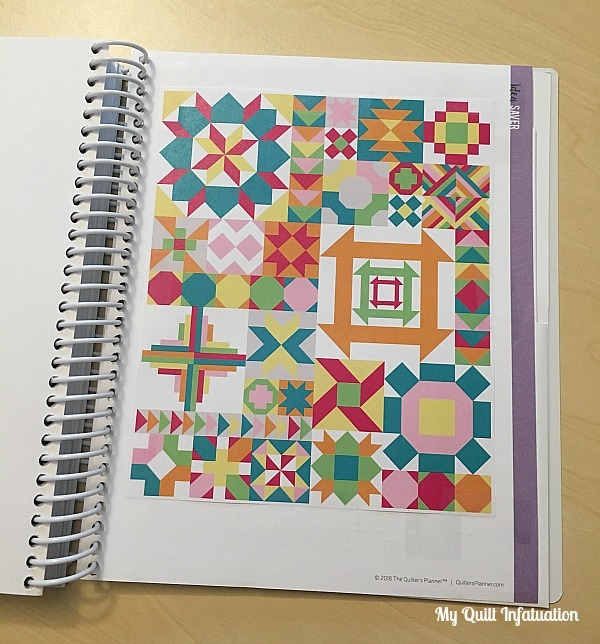 Can you believe that we're getting into the home stretch of this QAL? 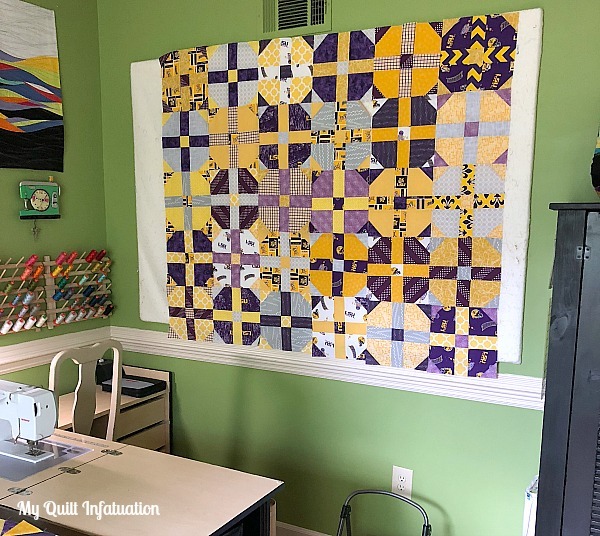 We only have two more months of blocks, plus a month of flying geese and snowball "fillers" and then it will be time to put the quilt top together. So, let's link up. I can't wait to see your August blocks! Happy August friends, and if you have kiddos, happy back-to-school! 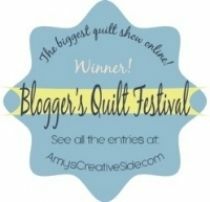 Though my wild thing won't admit it, I know he was ready to get back into the routine of a new school year, and I was ready to get back into my usual routine of quilting with more regularity; and I'm excited to say goodbye to summer by highlighting the best fabric deals from my very favorite shops. 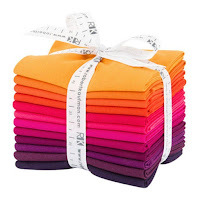 Fort Worth Fabric Studio is kicking things off with today's awesome giveaway. 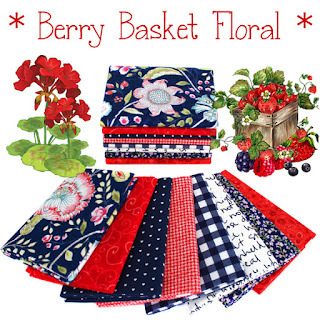 This Berry Basket Floral FQ bundle looks like it belongs on a summer picnic, doesn't it? As crazy as it sounds, the time to start thinking about holiday projects is NOW! All of the cute Christmas fabric lines are hitting shops, and with their Holiday House, Fort Worth Fabric Studio is a great place to start. 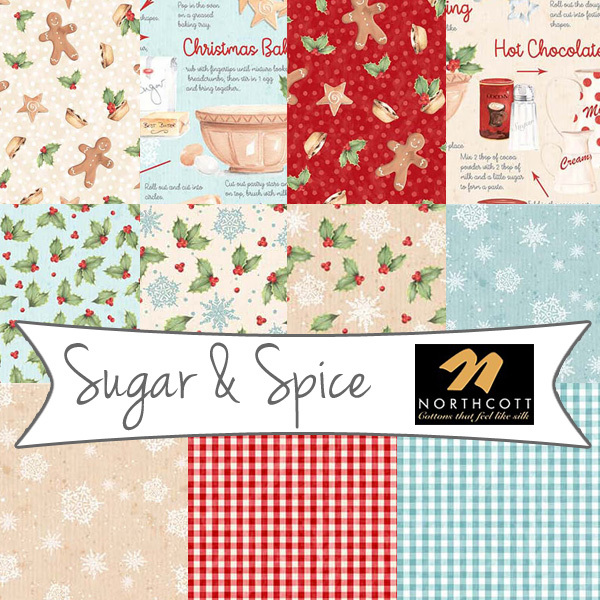 Their newest holiday line is Sugar and Spice, and they even have apron panels with this collection. These definitely won't last long, so if you need a festive holiday apron for yourself or for a gift, don't delay! 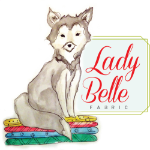 If you haven't visited in awhile, you need to check out the cool new look of Lady Belle Fabric's site! Even with the new photography, Lady Belle still has the same great prices on fabrics, especially bundles. 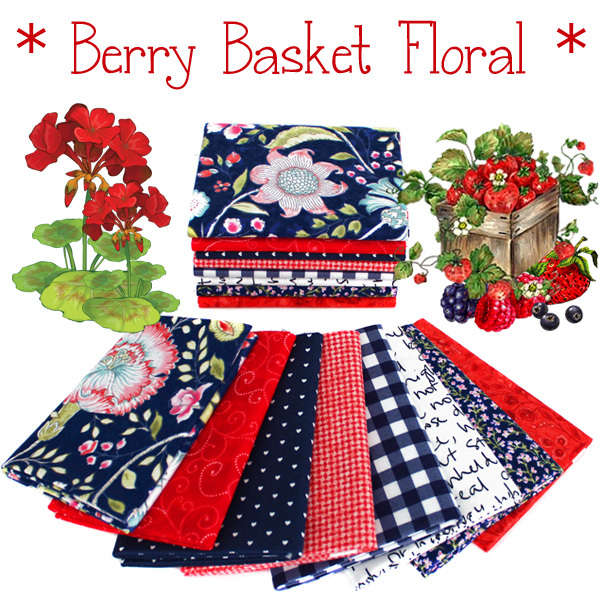 Right now, Anna Maria Horner Passion Flower and Sweet Dreams bundles are 20% off! And there are plenty of others on sale for 20%, 30% and 40% off as well! At Shabby Fabrics, their newest project in the Table Glitz series is super cute! These apples are the perfect way to get ready for cooler fall temperatures. 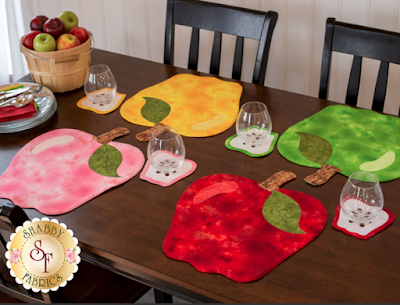 There are kits available, but the pattern and video demonstration are free! Head HERE for all of the details. The holiday collections have hit LouLou's Fabric Shop also, and there are lots of cute ones! 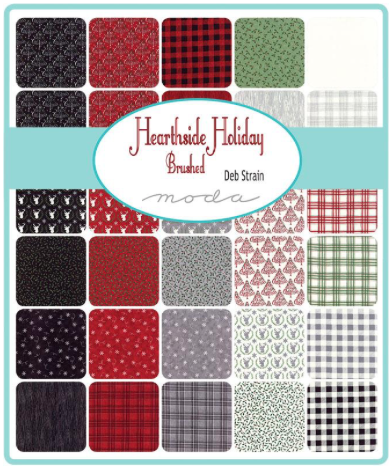 This Hearthside Holiday line by Deb Strain is just perfect if your Christmas decor style is woodsy and rustic rustic. 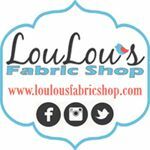 Right now, LouLou's is offering 20% off of your entire purchase with the code Summer Sale, and orders over $150 always ship free. This sale is only good through Friday, so head on over there to take advantage of it! 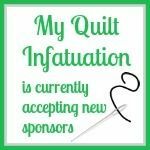 Before you head off to load up on goodies from these amazing shops, if you are a US reader (sorry international friends), take a minute to leave a single comment on this post to enter the FQ bundle giveaway. Remember to leave an email address if you're a no-reply blogger, and only one entry per person please! Unfortunately, replies to your own comment counts as an entry (the system numbers those, too), so remember to put your email address in your comment. Additional replies/comments/entries are always deleted. I'll announce the winners at NEXT week's NTT (August 22nd). Happy Needle and Thread Thursday, ya'll! Well, my wild thing started school on Monday, and I am happy to report that my sewjo is back in full swing. 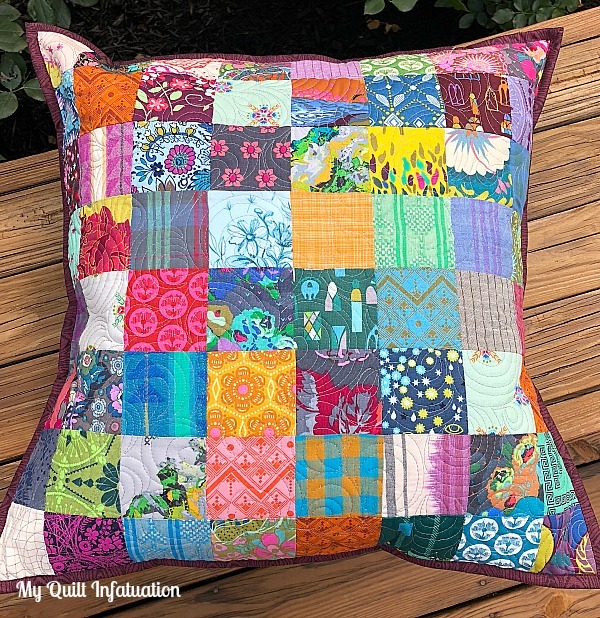 Apparently, all I needed was a little color inspiration to get my creativity flowing, and it started with a bundle of the most luscious Kona Solids. 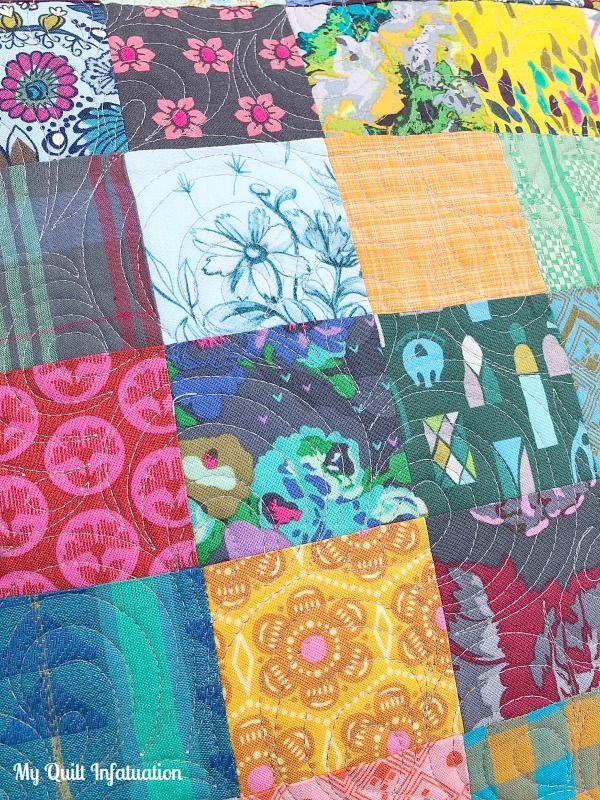 This quilt started with a gorgeous Kona collection called Birds of Paradise that I picked up at Quilt Market in May. It is not available in shops just yet, but you will be able to get it in just a couple of weeks. 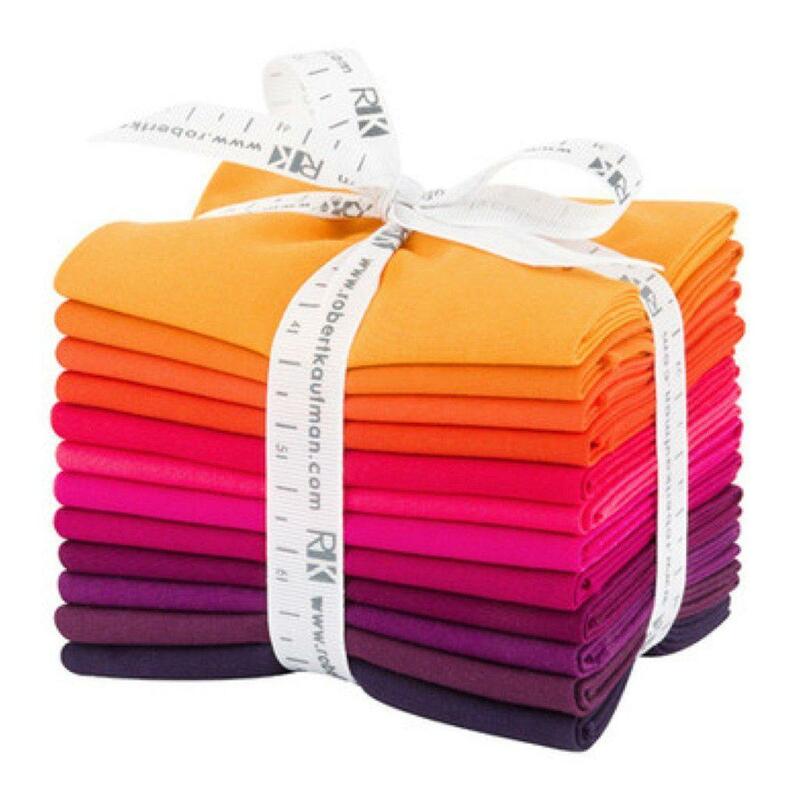 The bundle contains twelve colors- School Bus, Kumquat, Tangerine, Flame, Red, Watermelon, Pomegranate, Sangria, Bordeaux, Berry, Eggplant, and Midnight. Then, I added four additional colors from my stash (shown on boards in the photo above)- Corn Yellow, Papaya, Poppy, and Melon. When design inspiration struck, I didn't think to get a pretty picture of these solids in natural light before cutting into them, so not all of them are showing "true," which is why I definitely wanted to list them out for you. 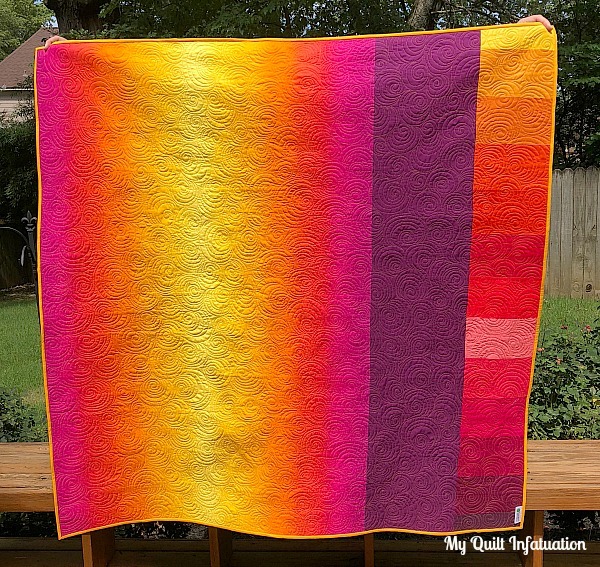 I tend to gravitate toward cooler colors much more often, but, I love all of the warmth in this quilt. I picked up the backing fabric from my LQS (and I'm super excited about it), so I just need to get this quilt basted and then I can start quilting it. In case you're wondering, I will be writing the pattern for this one, so stay tuned. Last week's party was full of amazing work (as it always is). 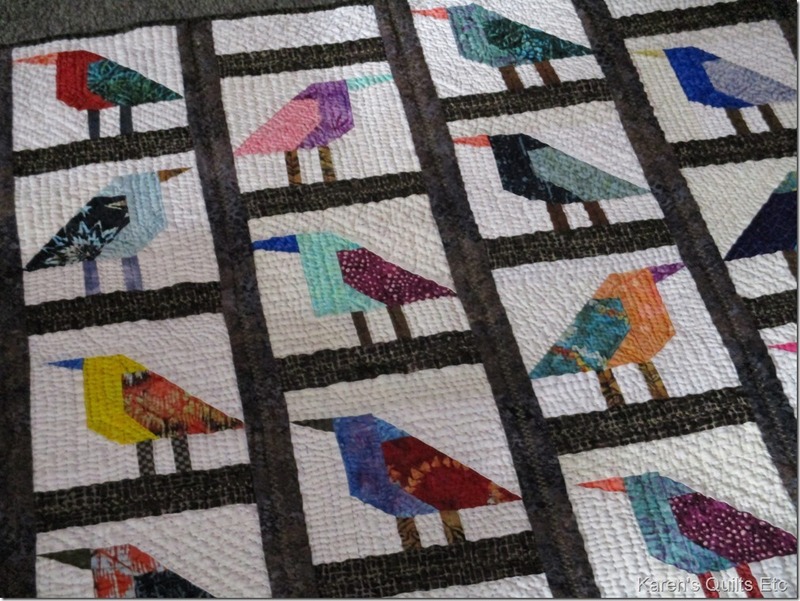 This precious bird quilt is by Karen at Quilts...etc. Y'all, this quilt is hand quilted and it is so fantastic, so be sure to check out her close-ups. Shannon at The Flemings Nine linked up her pretty Poolside quilt. 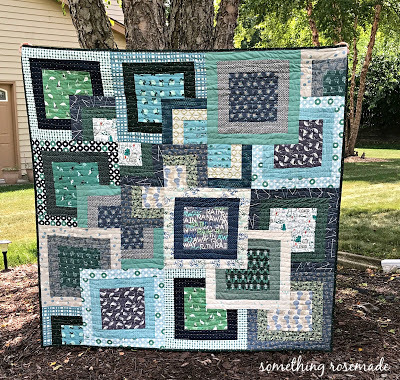 This Double Take quilt is by Laura at Slice of Pi Quilts- love it! 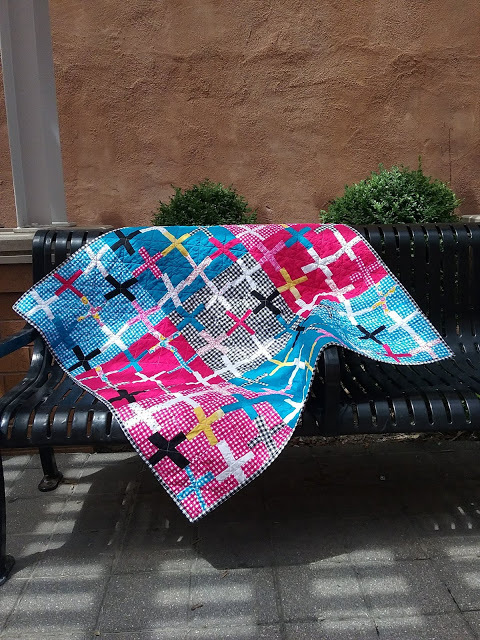 This quilt by Sew Preeti Quilts is made with all of her orphan blocks. Isn't it super cute? 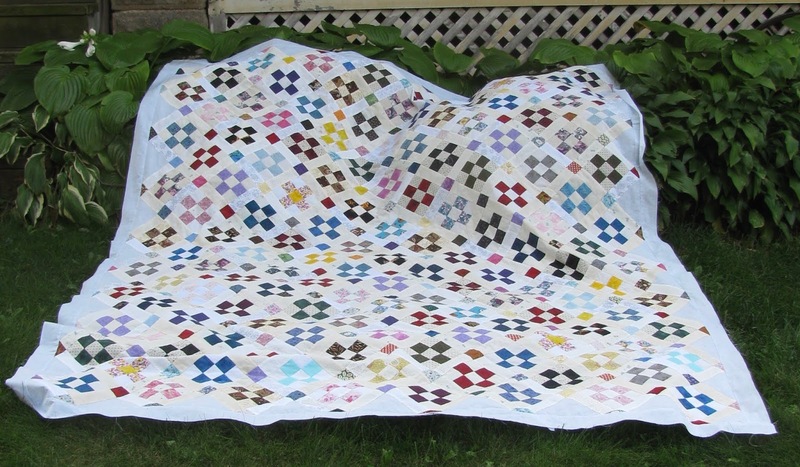 And finally, this Stacked Squares quilt is by Something Rosemade. I never seem to tire of the fun 3D illusion in this pattern, and these fabrics are just lovely. Alrighty, y'all. It's time to party! 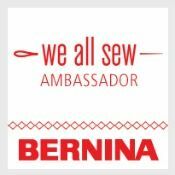 I can't wait to see what you've been sewing lately.